I always like to make note of the cruise lines’ altruistic endeavors when I come across them, and here’s one that’s worth mentioning; Princess launched an initiative in 2012 that dedicates an entire sailing to support a charitable cause. Princess has two cruises coming up that are dedicated to funding important charities, and you can help (plus, reap some benefits)! If you choose to take one (or both) of these cruises, a portion your cruise fare, ranging from $100-$300 per person (depending on stateroom category) will be donated on your behalf to the Section 501(c)(3) exempt public charities. . Your portion is tax deductible, and Princess Cruises will provide you with a written acknowledgment of your charitable contribution for tax purposes. Book this special 4-day sailing from Houston, Texas and a tax-deductible portion of your cruise fare, up to $300*, will be matched by Princess® and evenly donated on your behalf to Operation Homefront and the Vietnam Veterans Memorial Fund. Also, as part of our ongoing Military Benefit Program, active and retired military personnel who book this cruise will receive a $50 onboard credit. This will be a memorable experience to share with family, friends and fellow veterans. This unique cruise will feature military-themed programs and entertainment along with distinguished guests. Princess President and CEO Alan Buckelew, a Vietnam Veteran himself, will be onboard to host the cruise. Join us for the newest “Cruising for a Cause” sailing, which will support the American Heart Association (AHA). With a goal of raising $1 million for the AHA’s heart health programs and educational outreach, this 5-day Western Caribbean cruise from Ft. Lauderdale departs February 10-15, 2014 aboard Ruby Princess®. It’s simple! When you book this cruise, a tax-deductible portion of every cruise fare ranging from $100 to $300* per person depending on stateroom category will be matched by Princess® and donated on your behalf to the American Heart Association. 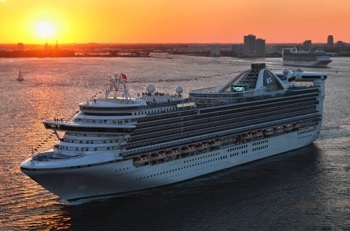 Learn more about Princess Cruises.